Published: Feb. 6, 2013 at 11:18 a.m. 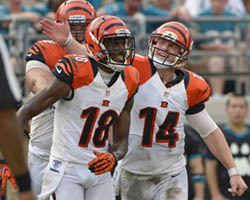 Updated: Feb. 7, 2013 at 07:33 a.m.
Titus Young has proven wildly successful at making noise off the field. Whether the wide receiver will make any on it for the St. Louis Rams next season is another story, but the agent for one of his new teammates doesn't sound convinced. Erik Burkhardt, who represents unrestricted free agent Danny Amendola, doesn't believe Young's signing will have any impact on his client's status with the Rams. "I don't think it affects Danny one bit," Burkhardt told the St. Louis Post-Dispatch on Tuesday. "Titus Young isn't anywhere in the same zip code as Danny as far as a player goes. I'm sure Young may disagree with that because he thinks he's better than Calvin Johnson." Fair point. The Rams claimed Young off waivers Tuesday after he was cut Monday by the Lions. Detroit's former second-round draft pick burnt every bridge in town, but the Rams are looking for weapons on offense after struggling to score points last season. Burkhardt characterized Amendola's negotiations with the Rams as "positive," saying, "I think they know what Danny brings to the team, and the spirit of the team aside from what he does on the field." We expect Amendola to return, although his durability is a concern. Meanwhile, a new start might benefit Young, but the Lions -- a team without a legitimate No. 2 wideout -- saw more than enough. For a player making Megatron-level boasts, Young's immediate task is to prove he can work within the team structure and produce for the Rams. The leash will be pulled tight from the start.